Ride in place. Move charity forward. LOS ANGELES, CA (April 13, 2015) – ZWIFT, a fitness-entertainment, multiplayer videogame developer shares its trailblazing software to allow national and international cyclists to virtually ride for charity. Partnering with the Tour de Pier – the award-winning cycling charity event held on the beautiful shores of Manhattan Beach, California – ZWIFT’s computer application makes it possible for any rider from around the world to cycle and raise money for three cancer charities: the Hirshberg Foundation for Pancreatic Cancer Research; the Uncle Kory Foundation and the Cancer Support Community Redondo Beach. 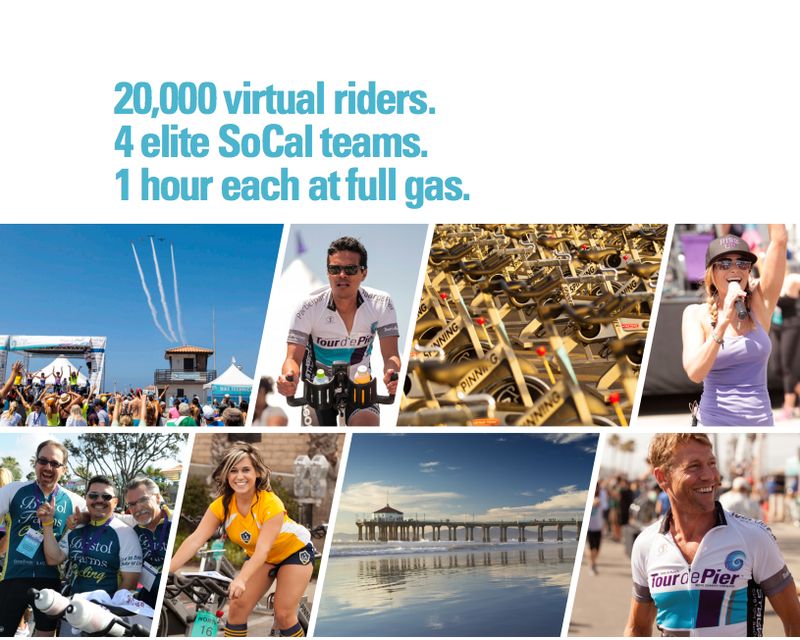 For the first time, the Tour de Pier will add the Elite Team Challenge — an event that will focus on four elite racing squads from Southern California racing against one another at full speed for one hour on the ZWIFT virtual cycling platform. Riders around the world will be encouraged to ride on ZWIFT to raise money for the Tour de Pier’s chosen charities. Based in Long Beach, California, ZWIFT‘s technology creates an opportunity for any rider with basic equipment to pedal their bike in a virtual world with other cyclists from around the world. Having recently launched in the fall of 2014, ZWIFT has acquired tens-of-thousands of global cyclists active on its virtual island. “Since the debut of the Tour de Pier three years ago, we wanted to find a way for it to be a worldwide event,” said Heath Gregory, co-founder, Tour de Pier. “Knowing the event’s potential of garnishing national and international attention, we are confident – thanks in part to the ZWIFT community – that this year’s event will easily surpass the fundraising efforts and notoriety of previous years.” In 2014, the award-winning Tour de Pier raised more than $500,000. This year, the cycling charity event anticipates raising $750,000 for cancer charities that are furthering the progress of research and developing new treatments that will eventually lead to cures. HOW IT WORKS: Riders interested in fundraising for the Tour de Pier only need a bicycle, an indoor cycle trainer such as Wahoo’s Award-Winning Kickr, a newer computer (PC or Mac will work) and an ANT+ dongle. To get started, visit www.zwift.com or www.tourdepier.com to download the software. Once registered and connected, riding with others is simple. ZWIFT’s software is free to use and is currently available to download. Riders will also have an opportunity to make donations. Held on Sunday, May 17 from 9:00 am – 1:00 pm, the Tour de Pier brings one of the hottest indoor fitness activities – stationary cycling – to the gorgeous outdoors with more than 1,000 cyclists overlooking the Manhattan Beach Pier and riding in place while taking in a Southern California iconic ocean view. Riders are also encouraged to post photos on their social media platforms using #tourdepier, #zwift or #ride4cure. Built on a long-standing passion for the sport of cycling, ZWIFT is a company of dedicated cyclists that also happen to be experienced software and video game developers. Combining that passion and deep understanding of the cycling world, ZWIFT is the first company to use massive multiplayer gaming technology to bring the outdoor cycling experience indoor. Athletes from around the globe can ride with each other in rich 3D generated worlds simply by connecting their existing devices (e.g., trainers, power meters, heart rate monitors, etc.) wirelessly via open industry standard ANT+. From friendly competition to casual group rides, ZWIFT is building a community of like-minded athletes united in the pursuit of a better indoor cycling experience. Jon Hirshberg, who started the first LA Cancer Challenge after the loss of his father Ron in 1997, came across the idea of doing a spin bike fundraiser after learning about an event that raised over $3 million in one day at cycling studios across the country. He approached his friend and long-time cycling enthusiast, Heath Gregory, about the idea of putting on a one-day event in their hometown of Manhattan Beach, CA. Coincidentally, Gregory had participated in a similar event produced by Livestrong in Barcelona during the 2009 Tour de France and vividly remembered hundreds of riders moving in unison all for a common cause. With the Hirshberg Foundation on board to produce the event and a team of board members eager to participate, planning for the Tour de Pier began. In March 2014, the City of Manhattan Beach Parks & Recreation Department won a prestigious award for Outstanding Special Event for the Tour De Pier, presented by the State of California Association of Parks and Recreation Commissioners. Competing against other cities throughout California, Tour de Pier was recognized as an event that significantly contributes to the overall betterment of the community. For more information, please visit www.tourdepier.com.